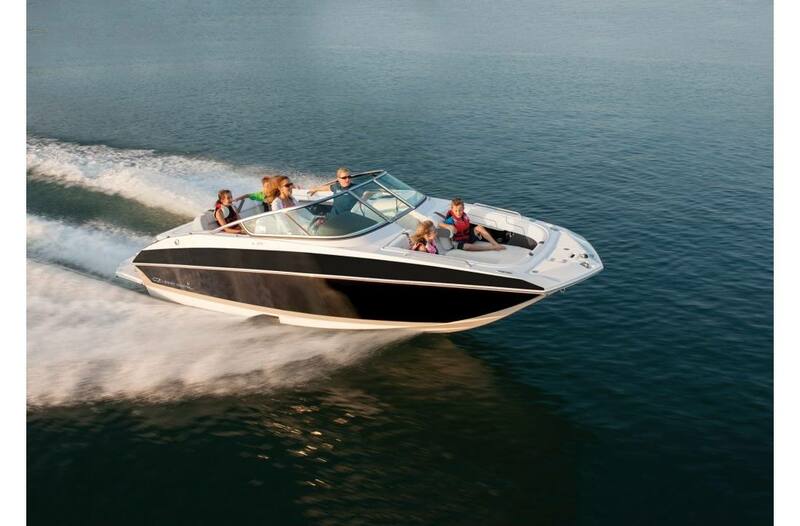 With a combination of power, panache, and performance, the 24 FasDeck proves that great athletes aren’t born, they’re made. 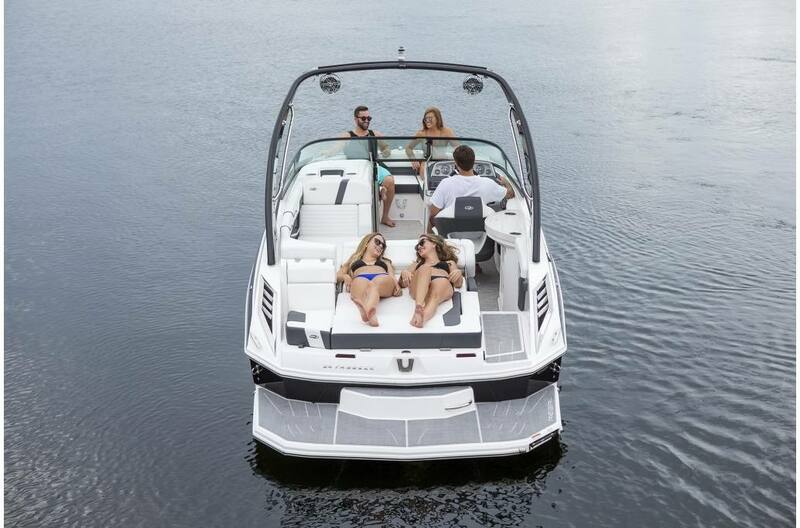 Coming from bloodlines of previous Regal FasTrac sportboat designs, but with the necessity of today’s deckboat functionality, the 24 FasDeck dances on top of chop, hugs tight to the water in turns, fits nicely into a garage, and tows with ease. 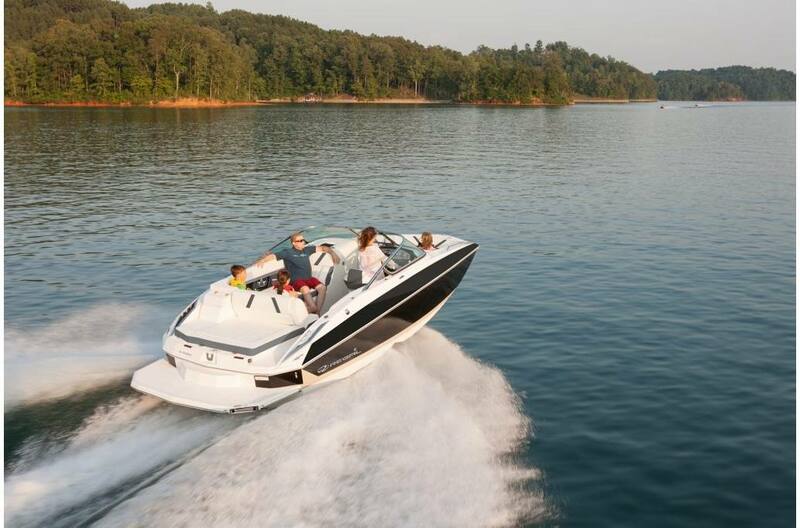 PowerTower: Low bridges, high and dry storage, boathouses, and towing are all taken care of with a push of a button. Arena Seating: Arena seating offers maximum storage space as well as the best seat in the house for viewing the water sports action. 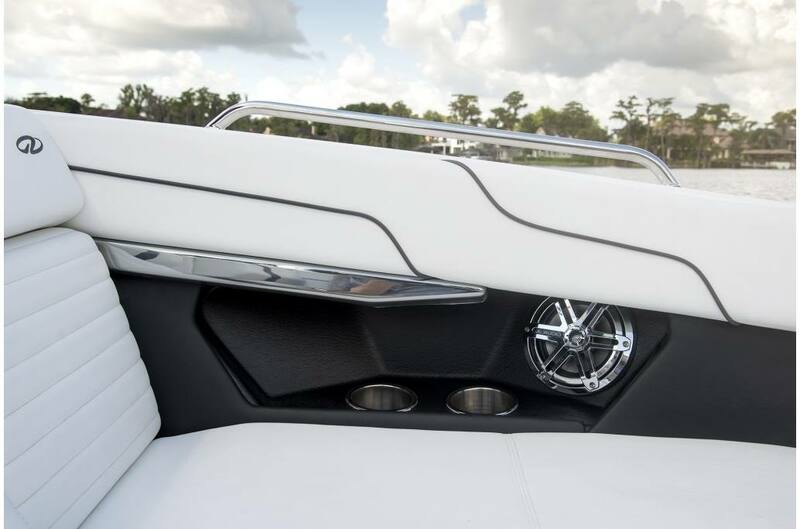 UltraLounge: The 6 position UltraLounge gives you the most versatile transom in boating. Extended Swim Platform: Boarding becomes easier and water sports are a breeze with a low-profile extended swim platform. Pressurized Water System: A pressurized water system is standard, complete with sinks, water pump, tank, and a filter. Chemical Toilet: The chemical toilet is a standard on this Regal. Cherry Cabinets: The hand crafted cherry reminds you of why you decided to buy a Regal. Moon Crystal Solid Surface Counter Tops: This head features a high quality Moon Crystal Solid Surface Counter Top for great looks and durability. Overhead Light: The overhead light in the head is a must. 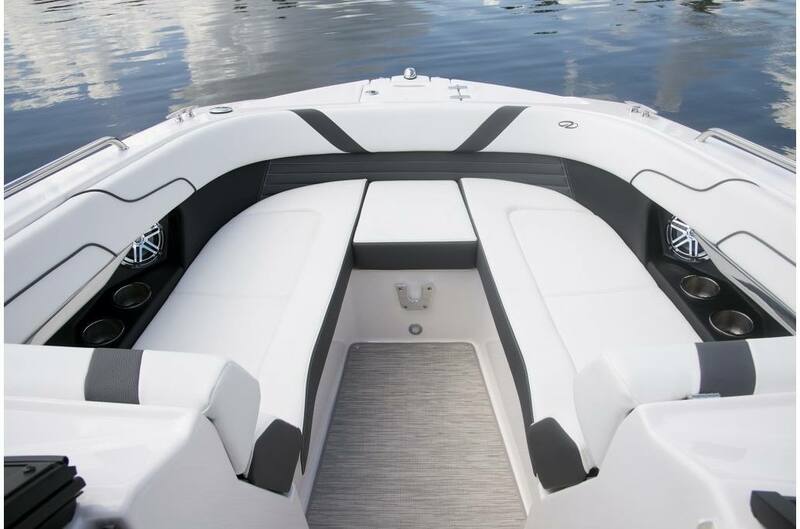 Soft Step Flooring: The head features a soft step floor, adding to the overall look and feel of the boat. Toilet Paper Holder: Regals feature designated storage for all of your amenities. Dual Bow Loungers: Lounging for 3 in the bow is easy and the standard arm rests let you relax more comfortably. Removable Cooler: The 24 FasDeck features a removable 25 quart Igloo cooler that will handle even the thirstiest of crews. StoreMore Bow Locker: StoreMore bow lockers ensure you will have plenty of space to store all your belongings. 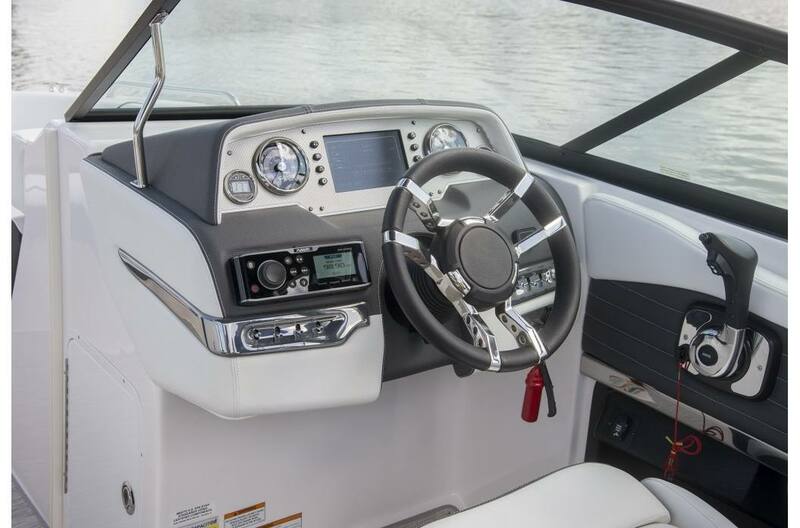 Transom Walk-Thru: The transom walk-thru on the 24 FasDeck ensures safe and easy boarding. Trash Receptacle: Regals come standard with a trash receptacle which has dedicated storage. Upholstery Packages: Your next Regal comes standard with the choice between three-tone Mocha or Titanium interiors. Faria Gauges: The fog-free Faria gauges not only give you the information you need but also turn the dash into a piece of art. Bow Ladder: The bow ladder makes boarding easy on either end of the boat. Extended Swim Platform: The extended swim platform is low to the water, making water sports activities easier. PowerTower: Lower bridges, high and dry storage, boathouses, and towing are all taken care of with a push of a button. Telescoping Ladder: The telescoping ladder is hidden under the platform. Bimini Top: The 24 FasDeck Bimini top features Sunbrella canvas and stainless bows and will shade the entire cockpit on a warm day. Stainless Steel Windshield Header: An anodized aluminum windshield header may be the industry norm, but Regal owners much prefer the standard stainless. Toilet Pump-Out Fittings - The pump out fittings allow you a connection to the local marina pump out station. 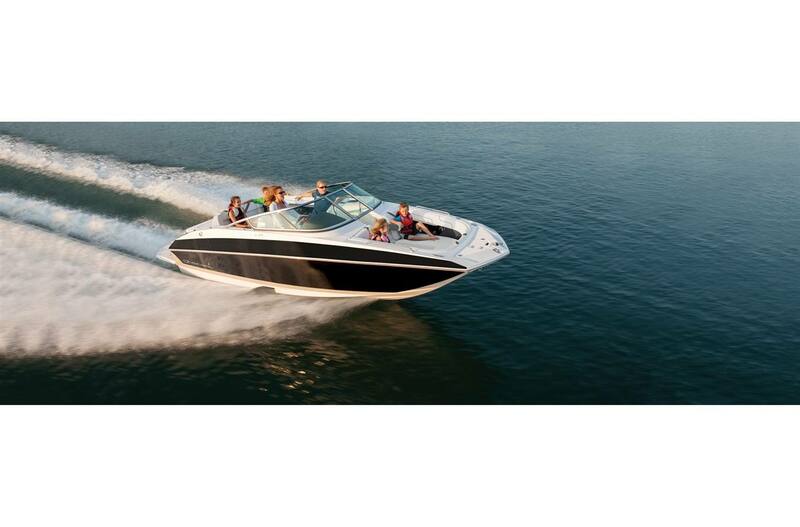 Trim Tabs - The trim tabs give you complete control over your boat even in the roughest of seas. Transom Shower/Pressure Water Package - The perfect way to rinse off after a salt-water swim. Cockpit Table - Teak - Enjoy the beautiful grains and texture of this sturdy table during an afternoon meal. Cockpit Carpet - When you're looking for something easy on the feet and with more luxury, the package matched carpet is too good to pass up. Mocha Cockpit Upholstery - A combination of chocolate, tan and white creates a warm classic look for your cockpit. Titanium Cockpit Upholstery - A combination of charcoal, light grey, and white gives a cool sporty look to your cockpit. Sport Graphics - Show off your younger side with edgy sport graphics. PowerTower - Black - The perfect place to pull a skier, mount your speakers or store your boards. Lowers with a push of a button. PowerTower - White - The perfect place to pull a skier, mount your speakers or store your boards. Lowers with a push of a button. 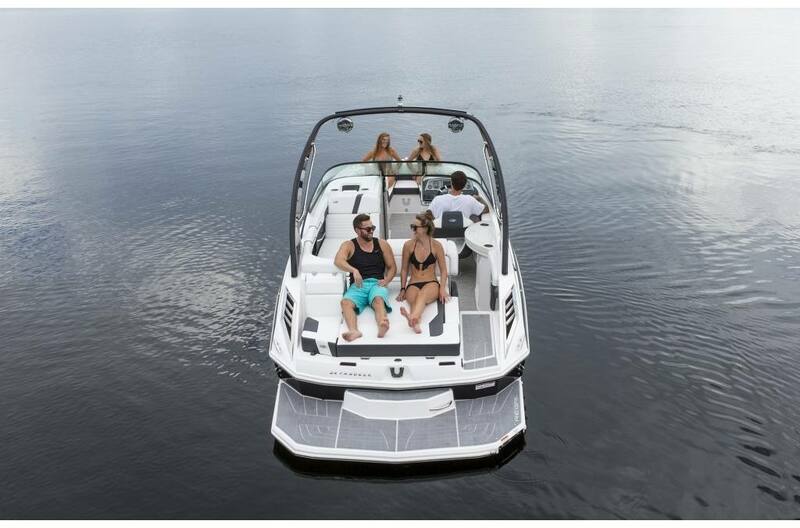 SeaDek Swim Platform - SeaDeck keeps your transom protected and gives a soft cushion for your feet. Easily cleans to look like new. RegalVue Display - Merc - A multi-function touch screen display that provides Engine Data, GPS with Chart Plotter, Music Control, Engine Diagnostics. RegalVue Display - Volvo - A multi-function touch screen display that provides Engine Data, GPS with Chart Plotter, Music Control, Engine Diagnostics. RegalVue Display with Cruise Control (Volvo Only) - A multi-function touch screen display that provides for the best speed control in the industry.